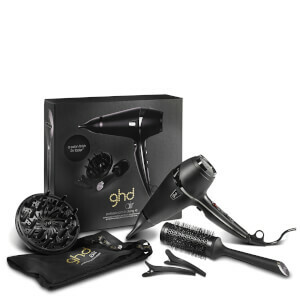 With its user friendly, comfortable design, this ghd Air™ Hair Dryer features advanced ionic technology to tame frizzy hair, giving you control over flyaways. This professional hair tool uses a 2100 Watt motor and removable air filter, allowing a high pressure air flow for a quicker and easier blow-dry. It comes complete with a cool shot button, that blows cold air to keep your locks in place after styling. Two nozzles are included so you can choose your preferred drying technique that will give you salon style results. Power and temperature controls, and a 3 metre long power cable make this the perfect hair dryer. E.N. Please Note: Supplied with EU two pin plug only. It's been some time since I purchased a hair dryer but this was worth the wait. It is powerful, lightweight and the nozzle helps direct and concerntrate the air to where you need it most. I felt like the nozzle helped minimise flyaways and resulted in a pretty perfect blow-dry! I have used GHD products for around 7 years and this has added to my collection - not disappointed!